With a view like the one at Poolside Café which sits just above Andrew (Boy) Charlton Pool on the eastern side of The Domain, you’d be forgiven for sitting at your table for the entire day, soaking it all in. Actually, you probably wouldn’t be forgiven by the other people lining up for a chance to dine here but it’s a nice thought. The first thing we were asked upon arrival is whether we minded a sunny table. While there is a small amount of indoor seating, only a handful of the tables outside are covered by the umbrellas. Otherwise it’s you against the Australian sun. The waitstaff look calm, yet professional and in-sync in their black and white striped tops. Our hostess was a bit brisk with customers on the morning but she got the job done and seated people quickly so I’m not complaining! Be prepared for a line and a bit of a wait normally. 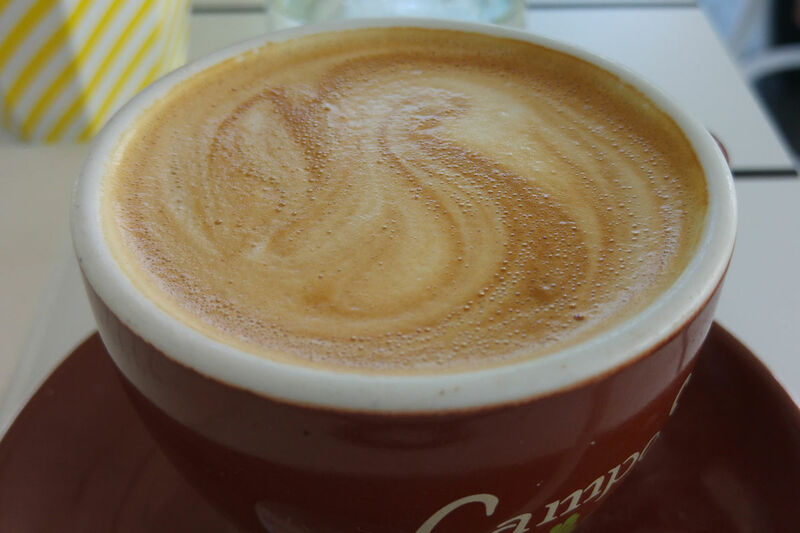 Coffee ($3.50) by Campos, prepared with slightly more milk than I would have liked but a good flavour nonetheless. Affogato, iced coffee or iced chocolate ($6.50) are also available but if you’re after something more unique, the Poolside latte (macadamia, coconut and double shot espresso, $5) might hit the spot. The first page of the drinks contains cool and refreshing cocktails. 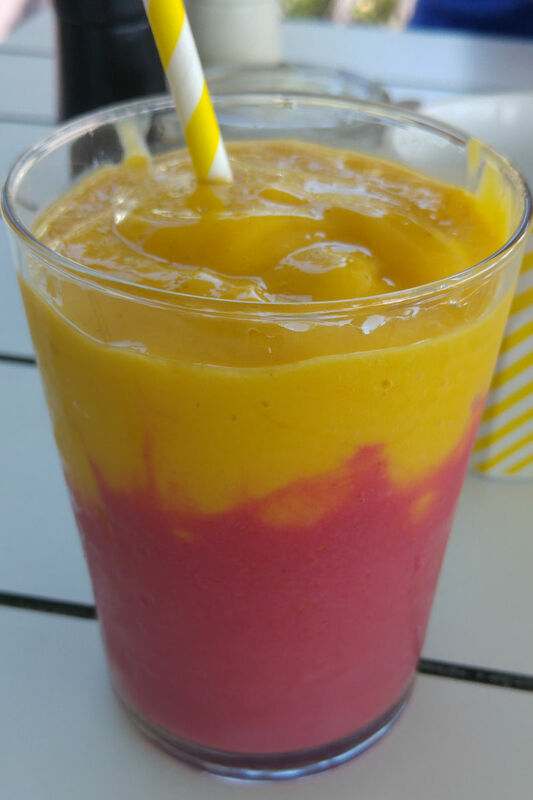 One of these is the summer sunrise smoothie ($9) made of mango, raspberry, banana and coconut water. It’s a visual representation of its namesake, presented well and tasting even better. The tartness of the raspberry and the sweet freshness of the mango work no matter whether you keep them separate or mix them. Other smoothies available include green guru (banana, avocado, mango, baby spinach, raw greens and coconut water), detox (apple, lemon, spinach, kale, mint, raw greens and coconut water) or strawberries & cream (strawberries, watermelon, raspberries, coconut water and whipped coconut cream). Cocktails such as blood Mary ($14.50), mimosa or bellini ($12 each) are available from 10am. It’s an inspired beverage menu which was encouraging to see. A bit of ingenuity goes a long way, especially when executed well. Poached eggs, sauteed mushroom, etc. I’m pleased to start the review of the food at Poolside Café with my favourite dish of the morning. 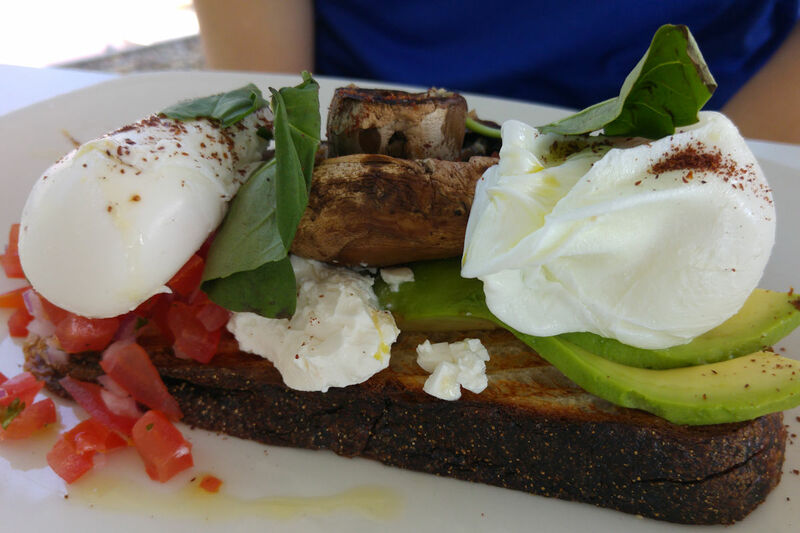 The poached eggs and sauteed mushrooms ($19) presented the best flavour combination of the morning. The avocado, mushrooms, poached eggs and salsa with fresh tomato and Spanish onion, combined with sheeps milk curd beautifully. It was presented simply and the flavours didn’t need any tampering. 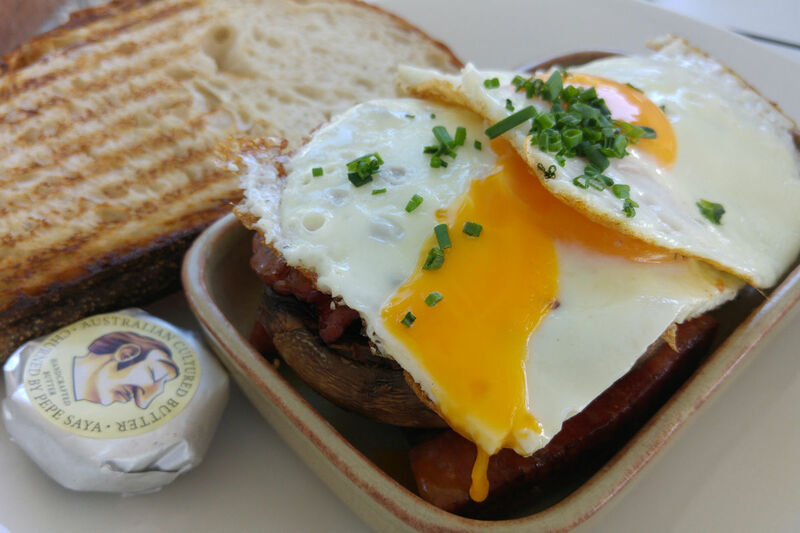 Fried egg, chorizo, mushroom, etc. While I didn’t enjoy the fried egg with chorizo and mushroom ($19.50) as much, my guest couldn’t have been happier with her choice. While initially it looked as though it would be difficult to eat in the narrow dish, the secret was in the layers. Beneath the two fried eggs was bacon (cooked crispy or not depending on your preference), chorizo, a garlic-stuffed field mushroom, potato hash and black pudding crumble. It’s a savoury-lover’s delight. It was all prepared exceptionally well but after tasting the fresh flavours of the first dish, nothing could compare! 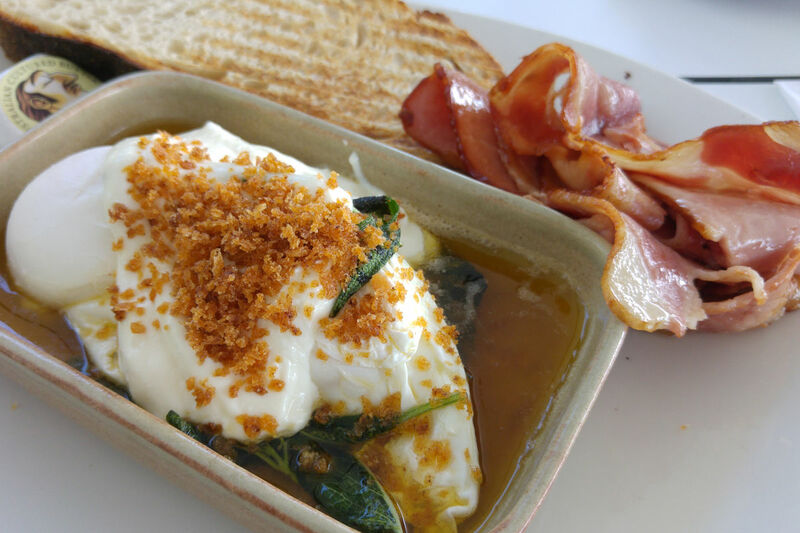 My dish was the poached eggs with sage burnt butter ($17). The sage and burnt butter is a combination normally found on dinner plates but it makes for a great accompaniment to eggs. While there certainly was a lot of butter, I moved the eggs to the toast, and it brought with it the perfect amount. The egg is then topped with yoghurt and paprika crumbs. Not something that I would have thought to add but the yoghurt offered a smoothness that complimented the egg and butter. Bacon ($4.50) on the side was plentiful for the price and it was nice to be offered cooked or crispy. Other dishes available include French toast with berries, toasted coconut ice cream, pistachio crumb & lemon curd, $16.50), blueberry pannacptta, matcha marshmallow fluff, toasted brioche, mulberries & pineapple sage ($15.50) as well as smoothie bowls ($16.50) which are served with granola and based on various smoothies such as pink paradise (strawberries, raspberries, banana, kiwi, coconut flakes, pepitas and white chia seeds). 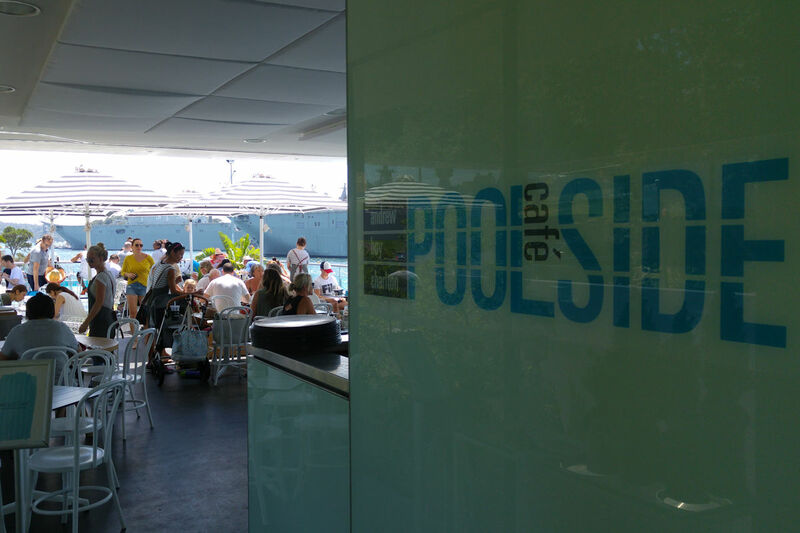 Poolside Café is certainly a quality establishment worth paying a visit. It’s a also a great spot to show off Sydney to guests and the prices aren’t outrageous. The friendly staff and superb meals and beverages will leave you wanting more. 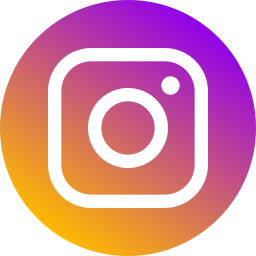 This entry was posted in Sydney - CBD and tagged Disabled access, Gluten free options, Organic Options, Outdoor seating, Parking close by, Water views. Bookmark the permalink.